I think it’s now very safe to say that we’re witnessing the last few hours of the euro’s advance, which began almost two weeks ago on March 7. The decline that should follow may be somewhat strong, but it’s very unlikely to retrace all of its preceding rally. I’ll have to wait for the rally to show a concrete sign of completion before I can calculate targets for the downside. By moving above 1.1361, price should move higher to reach between 1.1364 and 1.1375, while remaining above 1.1324. 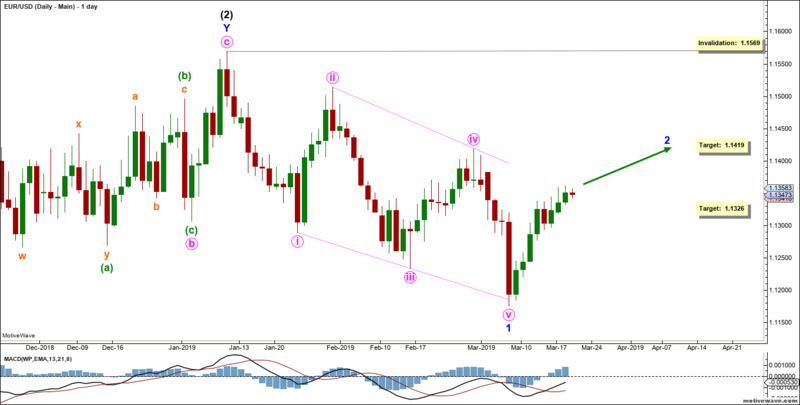 Elliott Wave chart analysis for the EURUSD for 19th March, 2019. Please click on the charts below to enlarge. Pink wave a is likely forming a leading diagonal labeled green waves (i) through (v). Green wave (v) is likely forming a zigzag labeled orange waves a, b and c.
The lowest point of orange wave b retraced exactly 61.8% of orange wave a, and the current low of orange wave b retraces exactly 50% of orange wave a. 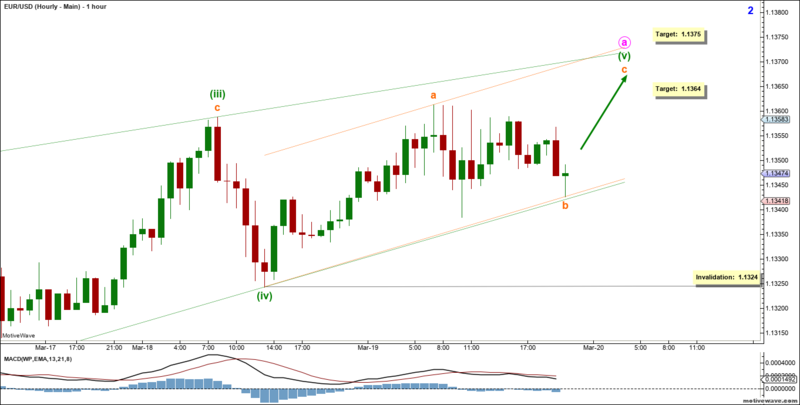 This count expects the euro to move toward the upside in orange wave c to complete green wave (v). This would be further confirmed by movement above 1.1361. At 1.1364 green wave (v) would reach 61.8% the length of green wave (iii), then at 1.1375 it would reach 78.6% of its length. This wave count would be entirely invalidated by movement below 1.1324 as orange wave b of this zigzag may not move beyond the start of orange wave a.